I can’t believe what I am seeing right now. Several of those bans have been defeated! The battles aren’t over yet though. We need your help — more on that in a second. Some of you are familiar with our “Preemption Project” that we started several years ago. For those that aren’t, allow me to elaborate for a minute. You see, back in 2008, Idaho passed a law that forbade Idaho cities/counties from enacting ordinances regarding firearms that were stricter than the state law. It prevents a patchwork of gun laws from being implemented all over the state. It prevents gun grabbing Mayors and Commissioners from infringing on the 2nd Amendment. Sometimes these municipalities test the wire. They want to see if they can get away with banning guns and have no one challenge them. Of course, the ISAA is more than willing to challenge these bans. To date, we have overturned over 50 gun bans or illegal ordinances in Idaho! Most recently, citizens in Boise and Pocatello asked about gun bans on their city buses. Treasure Valley Regional Transit serves the Boise area. Pocatello Regional Transit serves the Pocatello area. You see, the bus systems across Idaho are all owned by local government agencies that must operate under the Preemption Statute. Despite these systems having “private” employees running the buses, it doesn’t change the fact that they are owned by taxpayers. The ISAA sent the Treasure Valley Regional Transit Board and Director a letter. We informed them of their violation. Several elected officials, along with some informed citizens, who worked with us previously, helped push the issue forward and the ban was removed! Next, we contacted the City of Pocatello and the Pocatello Regional Transit Director about their illegal gun ban. Just days ago, we received an email from their attorney’s office informing us that the ban was being removed! These types of victories don’t happen overnight. It only happens because gun owners are willing to stand with us. They know that if they don’t overturn these illegal bans, they have to answer to you! As it turns out, there are several other gun bans on bus systems in Idaho. Citizens from Idaho Falls, Lewiston, and Coeur d’Alene have all reached out to us and asked for help in removing these gun bans from their bus systems. While the Boise and Pocatello systems were relatively easier battles than we expected, Lewiston and Coeur d’Alene could be much more difficult to overturn. >>> First, running the Preemption Project takes a lot of time and money to initiate. We need to build up our coffers for these battles. From materials to potential law suits, we have to be ready to strike immediately. Please consider a donation of $100, $50, or $25 TODAY to help build up our resources to fight these battles. >>> Second, we need you to reach out to your family and friends that live in any of the remaining cities (Idaho Falls, Lewiston, and Coeur d’Alene) and tell them what is going on. They need to be prepared to mobilize and support us! Idaho is not a place gun bans should exist — but they do. If it wasn’t for the ISAA and all of our great supporters that have helped us over the years, these bans would still be in place. Please act now and help us get even more victories! P.S. Gun bans on bus systems in Boise and Pocatello have been defeated! But the battles to defeat gun bans in Idaho isn’t over yet. We have also been informed of bans on bus systems in Idaho Falls, Lewiston, and the ever so conservative city of Coeur d’Alene. Please consider a donation of $100, $50, or $25 today to help us defeat more gun bans in Idaho. to bring them into compliance with State law. Please send me an email if you will about this. I was dismayed when I saw the “no weapons allowed on Boise buses, I also ignored it. As a charge against me would probably be defended without cost to me, and was not a strictly legal ban. Thank you for your effort in all areas to make Idaho safer and free of 2nd Amendment restrictions. of successful cities – How many are left & where? the residents of those cities need to know, and could be very helpful to the changing of those regulations. 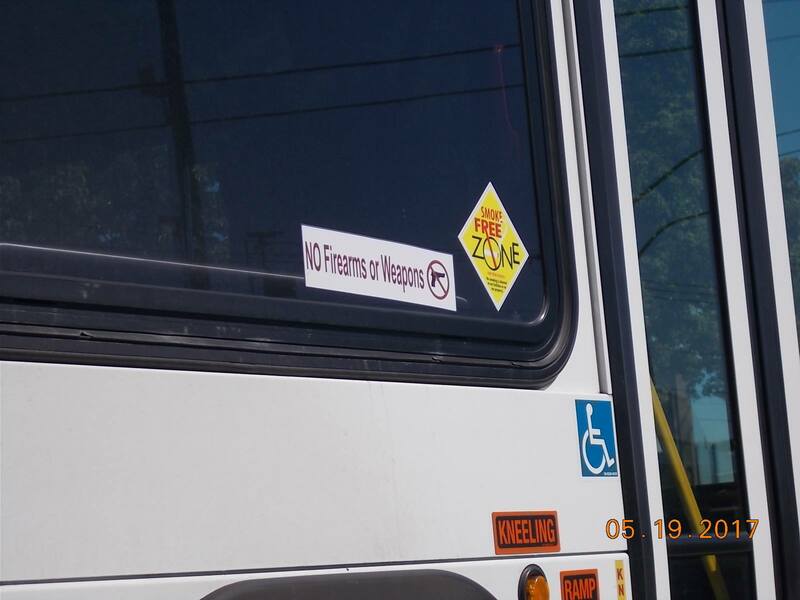 Are gun bans still being posted on buses in Lewiston and CDA? They shouldn’t be and if they are let us know! Thank you!